I have been blogging in some form or another for ten years. Much of that has included apologetics blogging. I enjoy writing apologetics-related blog posts and hopefully I have learned something over the years. 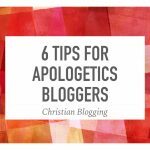 Here are a few things that I would like to offer to my fellow apologetics bloggers. Make sure to do your homework. What I mean by this is that it is important that we know that what we share is accurate. If you come across a claim that nicely supports your position, that is not enough. It does not take long to do some fact checking and it is easier than trying to rebuild your credibility after sharing something false. Your tone is as important as your content. We are to defend the faith with gentleness and respect (1 Peter 3:15). We are to share the truth in love (Ephesians 4:15). Apologists can get pretty passionate and sometimes that comes across with anger. It is possible for your negative emotions to get in the way of the good content that you share. Support other apologetics bloggers. Visit other people’s blogs and share their posts on social media. Consider leaving comments on their blog. Basically, all the stuff you would like others to do, do that for other people. Didn’t Jesus say something like that? Don’t be afraid to promote your own content. You may spend a lot of time crafting the perfect blog post but what do you do afterward? Are you blogging just to get something off your chest? Or do you want people to read it? Use social media and email and any other tools to get your message out. If it is worth writing, it is worth sharing. Don’t be obligated to debate with all your critics. I love when people comment on my blog posts. Sometimes people disagree with me and I am good with that. There are people who seem to want to have a running debate with me. My policy is to clarify my position once and at most twice and then I leave it. I don’t have the time or desire to debate in the comments section. I do sometimes take my clarifications and repurpose them into a new blog post in case others have the same confusion. God bless all you apologetics bloggers out there. What you do matters. Keep fighting the good fight. ← Why Do People With Autism Avoid Eye Contact? I understand the desire to share our faith with others, but I have a difficult time with apologetics. There is absolutely no way to prove faith, as in the empirical sense. For example, sceince can neither prove nor disprove God’s existence. The tools science uses simply will not work to determine God’s existence. As Christians, there are reaspns why we believe what we believe, but the bottom line is faith. If you need ‘proof’ of your faith, maybe you need to trust God. Thank you for your comment. I hear your concerns but I think I will blog a response rather than just comment here because there may be others who have the same concerns.